DIE Veneris, 18 die Januarii. Speaker of H. C's Speech. Message to H. C. with a Copy of L. Mordant's Answer. Precedente concerning Examination of Public Accompts, &c.
Message from H. C. to return Lady Holles' Bill. Lady Frazer & al. Nat. Bill. Epus.Rochester. Johannes Ds. Robertes, Custos Privati Sigilli. The King, being seated in His Royal Throne, arrayed with His Regal Robes and Ornaments, commanded the Gentleman Usher of the Black Rod to give Notice to the House of Commons, "That it is His Majesty's Pleasure that they should come up presently, and attend His Majesty, with their Speaker." "Since the Two Houses of Parliament, by Your Majesty's Command, were last convened, they have with great Care inspected the State of the Kingdom: They find Your Majesty engaged in a sharp and costly War, opposed by mighty Princes and States, that are in Conjunction against us. They see with Sorrow the greatest Part of Your Metropolitan City buried in Ashes. These are Ardua Regni indeed, and fit only for the Advice of a loyal Parliament. But, Sir, looking narrowly into Things, we found our Body Politic entering into a Consumption; our Treasures, that are the Sinews of War and the Bond of Peace, as much exhausted; the great Aids which are given to Your Majesty for the Maintenance of the War are but like the Blood in its Circulation, which will return again, and nourish all the Parts: But a great deal is Yearly transported in Specie into France, to bring Home Apes and Peacocks; and the best Returns are but Supersluities and Vanities: We have therefore unanimously besought Your Majesty to stop this Issue of Blood; and we hope Your Majesty's most seasonable and gracious Proclamation will prevent the future Expiration of these Spirits. "We have likewise been alarmed from all Parts of the Kingdom, by the Insolencies of Popish Priests and Jesuits, who, by their great Numbers and bold Writings, declare to all the World, they are in Expectation of a plentiful Harvest here in England: But Your Majesty, by Your Gracious Answer to the Desire of both Your Houses, Your Command for all Officers and Soldiers in Your Majesty's Pay to take the Oaths of Allegiance and Supremacy, and Your Proclamation for the Departure of Priests and Jesuits out of this Nation, have in a great Measure secured us against those Fears. "When Your Majesty was pleased, at the Opening of this Session of Parliament, to speak to us, You commanded us to find out the best Expedients we could, for carrying on the War with as little Burden to the People as was possible. "The Knights, Citizens, and Burgesses of the Commons House of Parliament, have industriously applied themselves to the Consideration of this Matter. They quickly resolved of a Supply for Your Majesty, suitable to Your Occasions, of Eighteen Hundred Thousand Pounds: But it hath taken up much of their Time, so to lay this Aid, that it may not seem a Burden. A little Weight lying always upon One Shoulder will at length become uneasy; but being shifted sometimes to the other Shoulder, there will be some Refreshment. "Multorum Manibus grande levatur Onus. This Bill we hope, will speedily bring in a considerable Sum of ready Money, for Your Majesty's present Use. "We have likewise taken Care for supplying the Remainder of the Eighteen Hundred Thousand Pounds by another Bill remaining with us, which in a short Time will be ready to be presented to Your Majesty. "The better to enable Your Majesty's good Subjects to pay these several Aids, and with Chearfulness to supply Your Majesty's future Occasions; we thought it necessary to remove a Nuisance out of their Way. The infinite Number of Foreign Cattle that were daily imported did glut our Markets, and bring down the Prices both of our (fn. 2) home-bred Cattle and our Lands; therefore we have prepared a Bill for the prohibiting of any Foreign Cattle for Seven Years. "We find Your Majesty's Mint is not so well employed as formerly; and the Reason is, because the Fees and Wages of the Officers and Workmen is in Part paid out of the Bullion that is brought to be coined, and what is wanting is made up by Your Majesty. We have, therefore, for the Ease of Your Majesty and those that shall bring in any Plate or Bullion to be coined there, made another Provision, by an Imposition upon Wines, Brandy, and Cyder, imported from any Foreign Nations. "Having given Your Majesty this short Account at present, we shall, with Your Leave, return to perfect those Bills that still remain with us; and we hope so to finish them to Your Majesty's Satisfaction, that all Your Majesty's Enemies both at Home and Abroad may see and feel the Effects of this blessed Correspondence between our Gracious King and His loyal Parliament." "1. An Act for raising Money, by a Poll and otherwise, towards the Maintenance of the present War." "2. An Act for encouraging of Coinage." "3. An Act prohibiting the Importation of Cattle from Ireland and other Parts beyond the Seas, and Fish taken by Foreigners." "4. An Act to continue a former Act, for preventing of Theft and Rapine upon the Northern Borders of England." "5. An Act for burying in Woollen only." "6. An Act for enlarging the Time given by a former Act for Redemption of Mortgages made by the Earl of Cleveland." "7. An Act for naturalizing of Isabella of Nassaw, Wife of the Right Honourable the Lord Arlington, One of His Majesty's Principal Secretaries of State." "8. 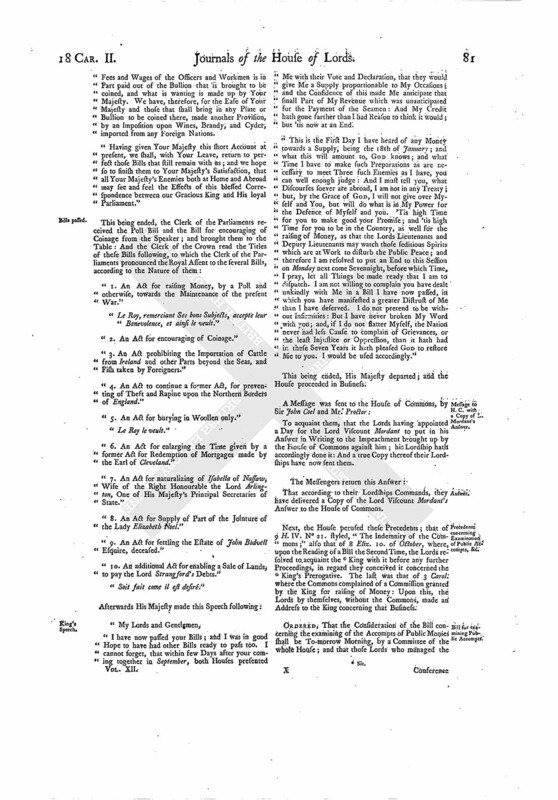 An Act for Supply of Part of the Jointure of the Lady Elizabeth Noel." "9. 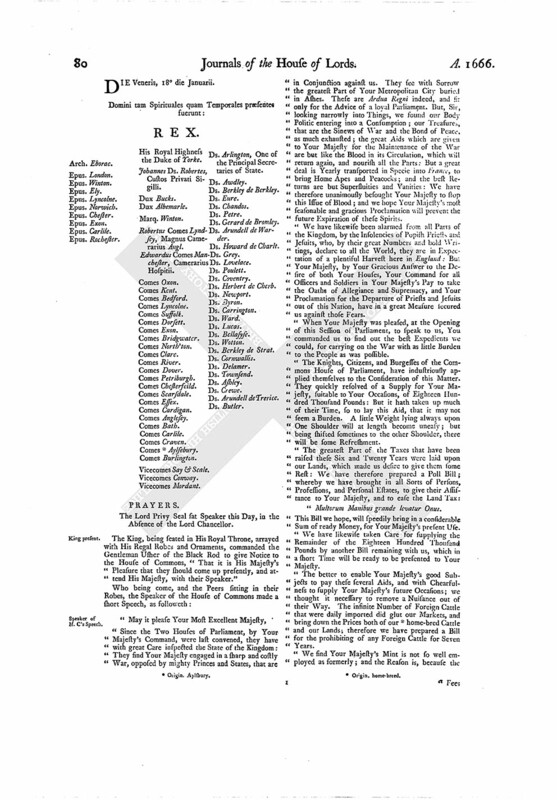 An Act for settling the Estate of John Bodvell Esquire, deceased." "10. An additional Act for enabling a Sale of Lands, to pay the Lord Strangford's Debts." This being ended, His Majesty departed; and the House proceeded in Business. To acquaint them, that the Lords having appointed a Day for the Lord Viscount Mordant to put in his Answer in Writing to the Impeachment brought up by the House of Commons against him; his Lordship hath accordingly done it: And a true Copy thereof their Lordships have now sent them. That according to their Lordships Commands, they have delivered a Copy of the Lord Viscount Mordant's Answer to the House of Commons. Next, the House perused these Precedents; that of 9 H. IV. N° 21. styled, "The Indemnity of the Commons;" also that of 8 Eliz. 10. of October, where, upon the Reading of a Bill the Second Time, the Lords resolved to acquaint the (fn. 3) King with it before any further Proceedings, in regard they conceived it concerned the (fn. 3) King's Prerogative. The last was that of 3 Carol. where the Commons complained of a Commission granted by the King for raising of Money: Upon this, the Lords by themselves, without the Commons, made an Address to the King concerning that Business. 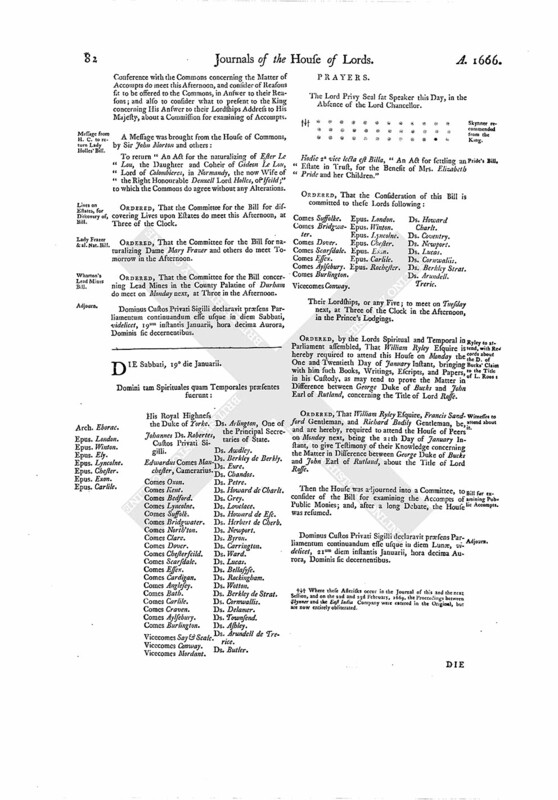 ORDERED, That the Consideration of the Bill concerning the examining of the Accompts of Public Monies shall be To-morrow Morning, by a Committee of the whole House; and that those Lords who managed the Conference with the Commons concerning the Matter of Accompts do meet this Afternoon, and consider of Reasons fit to be offered to the Commons, in Answer to their Reasons; and also to consider what to present to the King concerning His Answer to their Lordships Address to His Majesty, about a Commission for examining of Accompts. To return "An Act for the naturalizing of Ester Lc Lou, the Daughter and Coheir of Gideon Le Lou, Lord of Colombieres, in Normandy, the now Wife of the Right Honourable Denzell Lord Holles, of Ifeild;" to which the Commons do agree without any Alterations. ORDERED, That the Committee for the Bill for discovering Lives upon Estates do meet this Afternoon, at Three of the Clock. ORDERED, That the Committee for the Bill for naturalizing Dame Mary Frazer and others do meet Tomorrow in the Afternoon. ORDERED, That the Committee for the Bill concerning Lead Mines in the County Palatine of Durham do meet on Monday next, at Three in the Afternoon. Dominus Custos Privati Sigilli declaravit præsens Parliamentum continuandum esse usque in diem Sabbati, videlicet, 19um instantis Januarii, hora decima Aurora, Dominis sic decernentibus.